Welcome to Durban Business, a market of growing and emerging opportunities. Durban is located in KwaZulu-Natal, the second biggest economy in South Africa. Local and foreign investments are flowing into Durban, as it continues to ascend to its rightful place of recognition as a world class city. By 2030, eThekwini aims to be the ‘most caring, liveable city in Africa’ which will be achieved through collaboration and partnership between business and government. The Durban Chamber of Commerce and Industry is proud to be associated with the leading Durban Businesses to promote our city nationally and globally as a preferred business destination. Our team works with businesses from SMEs to multi-nationals to ensure they get the best possible support while doing business in our city. Our services can raise your profile, cut your costs and provide links to our close network of influential business leaders. We welcome you to continue to explore this website for opportunities for your business. We believe that together, we grow stronger. Become a member of Durban Chamber of Commerce & Industry Now! The city of Durban is the second most important manufacturing hub in South Africa. It's responsible for over 65 percent of the total revenue generated in the province of Kwazulu-Natal. With an abundance of resources and strategic location on world shipping routes its no wonder that for over 150 years Durban is a hub of econonic activity and industrial development. Durban is the home of the 9th largest harbor in the world. The modern Port of Durban grew around trade from Johannesburg. Today Durban has the busiest container port in Africa. 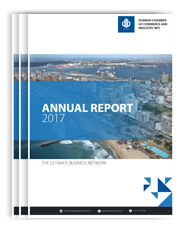 Large corporations have head offices in Durban recognising that with continued economic growth and an abundance of business opportunities, it's clear that Durban is the place to be. It is intended solely for the person or entity to whom or which it is addressed. If you are not the intended recipient, you are not entitled to read, copy, use or disclose any information contained in this message to others. Disclosure and/or use may lead to civil liability. If you received this message in error, please notify the sender immediately by replying to this e-mail or by telephoning the sender and thereafter permanently deleting this message and any attachments to it. The Durban Chamber of Commerce and Industry does not guarantee that this message is secure or error-free as information could be intercepted, corrupted, lost, destroyed, arrive late or incomplete, or contain viruses. All reasonable precautions have been taken by us to ensure that no viruses are present in our e-mail communications and the Chamber cannot accept responsibility for loss or damage arising from the use of the e-mail or attachments.